Tropical storm Fay is passing very close to Bermuda this morning, bringing maximum sustained winds of 60mph to 70mph and heavy rains. Meanwhile conditions for tropical storm development in the Atlantic are hotting up. Tropical storm Fay, the sixth named storm of the 2014 Atlantic Hurricane Season, developed out of a subtropical low that moved northwards, was named first as sub-topical storm Fay before passing into the zone where it became a fully fledged tropical storm. Fay has come very close to reaching hurricane status, with maximum sustained winds reaching 70mph. Sustained winds of over 50mph and a gust of 67mph have been reported from Bermuda, but with Fay expected to pass just offshore the island will be spared the worst winds. 3 to 5 inches of rainfall is expected from tropical storm Fay as the storms rain bands affect Bermuda during the course of Sunday, after which Fay will move away towards the north-east and is expected to be absorbed into a cold front in the Atlantic by Monday. Fay formed at a time when the Atlantic has suddenly become much more conducive to storm development. After an extremely quiet season so far, the tropics suddenly look much more capable of supporting tropical storm and hurricane formation, with warmer sea-surface temperatures and much less dry air from Africa. The National Hurricane Center is currently monitoring invest 90L, which is a few hundred miles east of the Leeward islands. Currently the NHC says this area of disturbance has a 50% chance of becoming a tropical storm in the next 48 hours. Some forecasters are already expecting this to be named early this coming week. The forecast models show 90L becoming tropical storm Gonzalo and heading west, but then curving north due to a strong wind shear coming from the west. That wind shear could steer any storms that do form in the coming week or so, northwards and eventually away into the Atlantic, so out of harms way of the U.S. coastline. The graphic below shows the current forecast model predictions for invest 90L as it moves westwards. 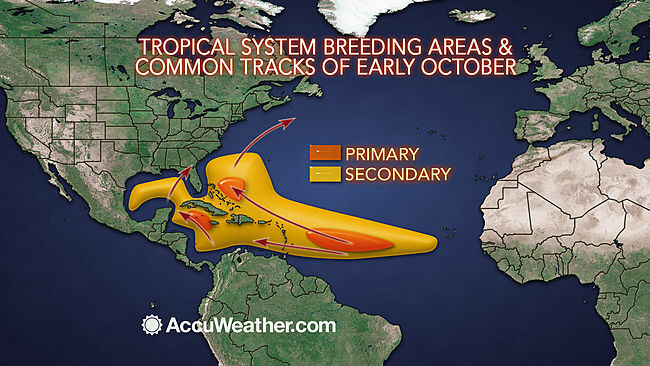 This image from Accuweather shows where the typical storm breeding areas are for October in the Atlantic tropical storm season. If the wind shear from the west weakens and we do see storm development in the coming weeks there could be a late season threat to the U.S., as many forecasters agree that conditions are much more conducive for development of storms now than in previous weeks. The Atlantic is running far behind average currently. Typically by the middle of October we would have seen nine named storms, but we have only just seen our sixth in 2014. There is time left for the season to catch up and still plenty of time for it to deliver a damaging blow to the insurance and reinsurance industry. It’s worth keeping an eye on the tropics this week as conditions continue to look more conducive for storm development. So visit and bookmark our 2014 Atlantic Hurricane Season page.